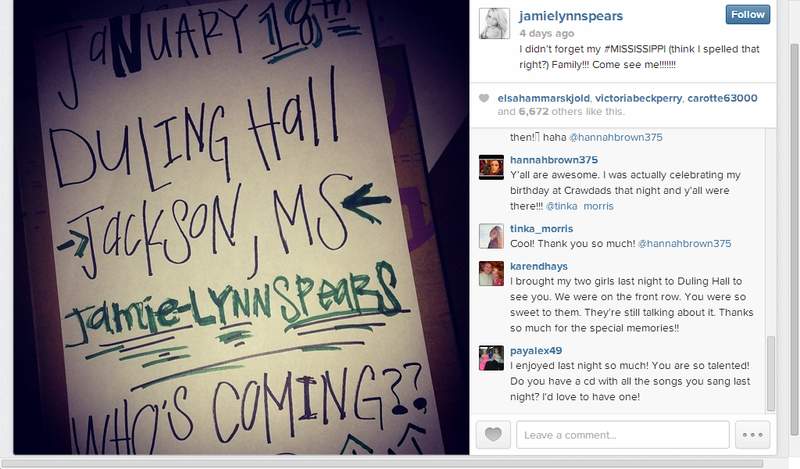 Jamie Lynn Spears was at Duling Hall in Jackson Mississippi Saturday night singing for fans, old classmates and friends alike. Posting this sign on her Instagram, the McComb Mississippi native told WAPT news “I think it’s really important to get back home, and share my music with people I grew up, and the states I grew up with”. Jamie added “country singer” to her resumé on November 26th of last year with the self-released single “How Could I Want More” under her Sweet Jamie Music, Inc. label. Although primarily known for playing the lead character in Nickelodeon’s Zoey 101 (2005-2008) Jamie, the little sister of Britney Spears, always had plans to sing and even sang the show’s theme song. In addition to her own project, she’s featured on “Chillin With You” , a song on big sis’ latest album Britney Jean released November 29 of last year. Watch the official video for “How could I Want More” below.